Coach Pat Moriarty with his family last season. Photo by Dave Bloniarz. SPRINGFIELD - When the opportunity presented itself, Pat Moriarty simply could not let it pass by. Having spent nearly half of his life at one place, Moriarty, and his family, began to generate some discussion regarding life down the road and what lied beyond the hedges. As if it were fate, a lifestyle altering opportunity did arise. Albeit much quicker than expected. 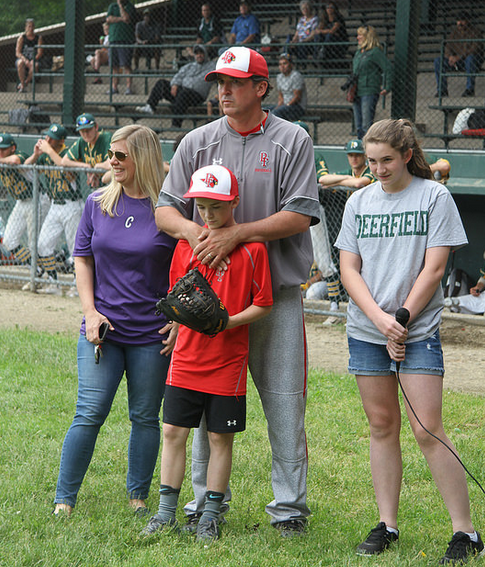 Last month, Moriarty, the longtime head baseball coach at former Cathedral High School, now Pope Francis High School in Springfield, was offered and accepted the same position at prestigious Deerfield Academy. A chance to coach at such a highly-reputable academic institution like Deerfield does not come about too often. So, once Moriarty discovered the head coaching position had become vacant, he immediately spun into action. But his decision to leave or not to leave did not come without a few sleepless nights. Moriarty's mind wrestled daily between the love he had for his current school and a chance for a new beginning. "As a proud graduate of Cathedral High School, and having been the head coach at Cathedral and Pope Francis the last 12 years, I never envisioned leaving the program," Moriarty said. "I love the school and, most importantly, I love the student-athletes. When Cathedral and Holyoke Catholic agreed to merge two years ago to become Pope Francis, there were many changes taking place. I realized that I needed to start exploring other possible career opportunities." The alliance between the two schools came as a direct result of the June 2011 tornado that ripped a destructive path through parts of Western Massachusetts, including downtown Springfield and outlying areas. Sitting squarely in the tornado's sights was Cathedral High School, which received considerable structural damage. The destruction was so intense that the building was deemed uninhabitable and needed to be closed permanently. Students returning in the fall ready to begin a new academic year were forced to conduct their classes inside a vacated elementary school in Wilbraham for six years, before taking up residence at Elms College in Chicopee this past September. A new building, set to open in 2018, is currently under construction on the grounds where the former Cathedral High School once sat. Memories of the good, and not so good, times will forever be linked to Moriarty, including the time, effort and hard work put forth by him in transforming Cathedral/Pope Francis into a legitimate Division 1 state power. "I will miss the relationships I formed with the student-athletes and families," said Moriarty, who played at Cathedral, and would later serve as an assistant coach at the school before taking over the head reins. "From a baseball perspective, it was rewarding to coach players like Chis Capuano, Nick Gorneault, Scott Barnes and Frank Crinella, who have all played professional ball. I am most proud of the relationships I have maintained with all of my student-athletes. Nearly 100 percent of all of my players have graduated from college and are now productive members of society. Together, we have built a great tradition here." During his time in charge of Cathedral/Pope Francis, Moriarty managed to guide the program into the postseason tournament in each 12 of those years, including a berth in the Super 8 tournament a year ago, becoming the only Western Mass. school thus far to be selected. His overall record with Cathedral/Pope Francis is an astonishing 186-78. Moriarty, who will also serve as a college adviser at Deerfield, takes over the baseball operations handed down to him by Steve August, who stepped down as Deerfield's head coach this past season. Moriarty had already developed a strong relationship with August, who prior to his time at Deerfield, worked in the Boston Red Sox organization and is also founder and director of the New England Ruffnecks baseball club. Once he realized August was exiting, Moriarty's gut told him that he needed to look into the position. "Deerfield Academy is Deerfield Academy," he said. "When the opportunity arose to potentially join their staff, I sat down with my wife Michelle and my two children Morgan (age 13) and Conor (age 12). We discussed it as a family. We took a ride to the campus and that is when we knew instantly that it would be a great fit for me and my family. "Working for (Deerfield) athletic director Bob Howe, who has an impeccable reputation, and to have the support of Steve, made our decision that much easier. My philosophy has always been, and will continue to be, that I expect my players to win in the classroom and on the field. I am confident we will continue to do both at Deerfield."